Ava Claire Romantica: Waiting For Me Is Now Available! Waiting For Me Is Now Available! Billionaire Dominant Logan Mason doesn't cuddle, doesn't get attached, and doesn't do romantic relationships. But when he wakes up beside Melissa Foster, a submissive who refuses her true nature, she makes him question his own. What if his rules are actually keeping him from finding something more? Tomorrow's my Flash Giveaway @ Sammie's Book Blog! 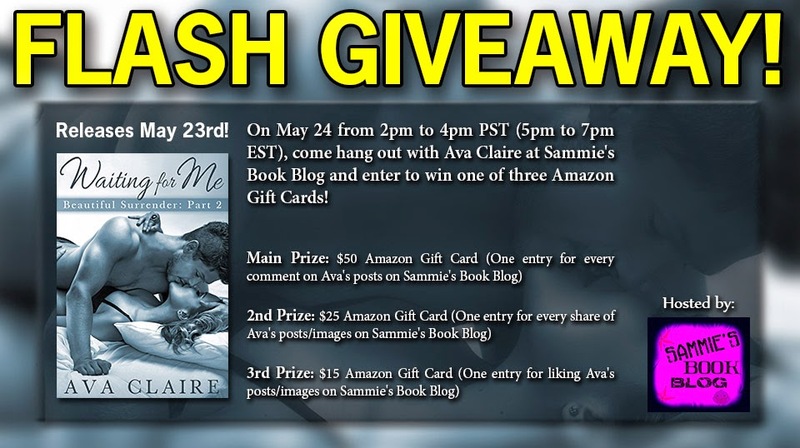 Come say hello and connect with me while I take over her page from 2-4pm PST (5-7pm EST) for a chance to win one of three Amazon gift cards! Waiting For Me Update (and giveaway! )!